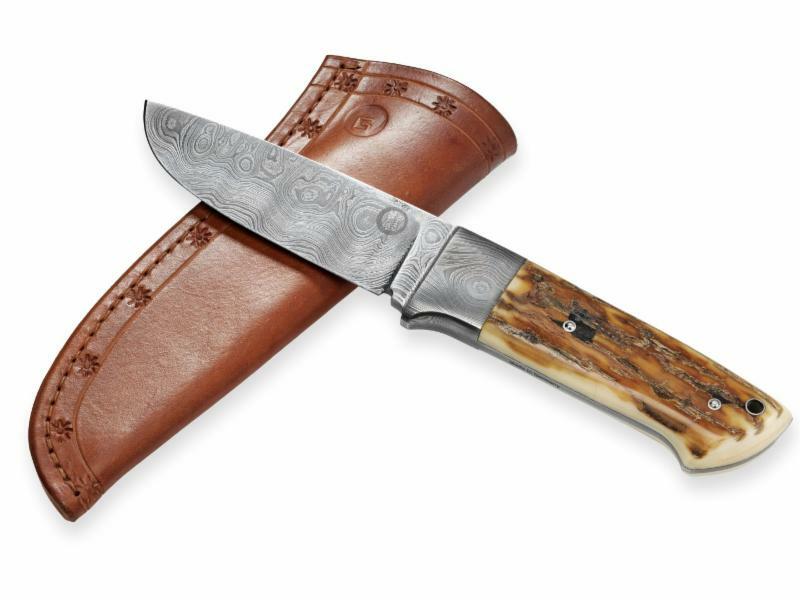 Knife knuts usually appreciate the swirling beauty of Damascus steel for its own sake. But to spur the interest of collectors, GASTON J. GLOCK style LP, has taken to crafting unique blades out of historic steel. Like one utilizing hull material from a WWII German battleship. Or a wehrmacht tank. Their latest effort utilizes the barrels of some of the GLOCKs that pro shooter Dave Sevigny used to win some of his many titles. Unlike the guns that sacrificed themselves to create them, these are decidedly not utilitarian cutting tools. The three fixed blades will set you back between $3900 and $4500 depending on the knife and handle material. Press release after the jump . . .
Smyrna, Ga. (March 23, 2015) – There are many words that spring to mind when discussing the popular “Glock” line of pistols, but “beautiful” and “artistic” are not often among them. Yet that’s exactly what the craftsmen at GASTON J. GLOCK style LP, in conjunction with famed blacksmith Balbach, have produced by hammering three barrels from world champion shooter Dave Sevigny’s Glocks into stunning Damascus-style knives. These aren’t just any barrels, either. Two of the three barrels were used to win USPSA national championships by Sevigny, and the third is the barrel from his primary practice and training gun during his championship run. The same barrels that were key to his pistol’s reliability and accuracy are now some of the finest knives money can buy. And there are only three. This pistol was used to win the 2005 USPSA Limited-10 Nationals and 2006 USPSA Limited Nationals, which represented Sevigny’s 4th and 6th USPSA National Championship wins. Both of these Nationals were hosted at the PASA Park in Quincy, Ill. and were composed of 18 stages with over 350 competitors participating across all divisions. The Limited-10 division differentiates itself from the regular limited division by limiting shooters to ten rounds per magazine. Sevigny also won several other regional and state level championships using this same barrel. 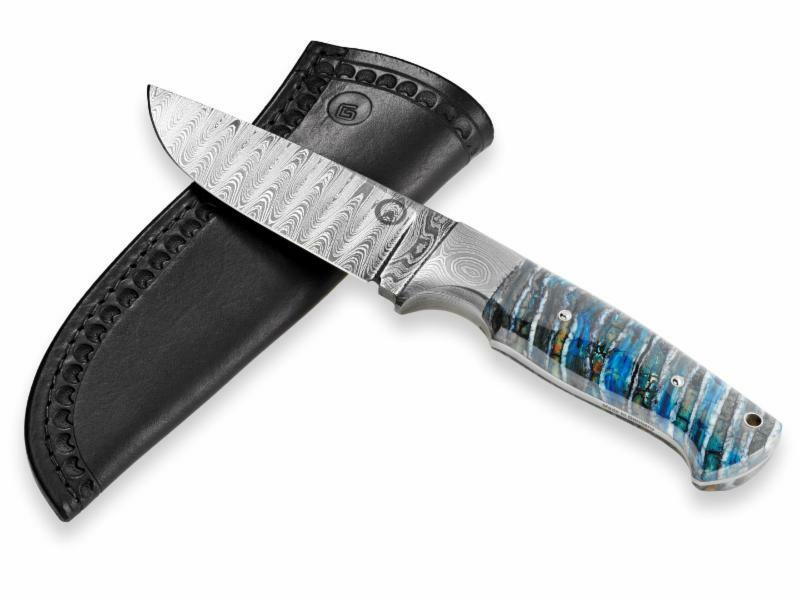 Once a barrel, now transformed into a stunning knife, the first knife in the collection features a contrasting blue and green mammoth molar handle, shot through with streaks of white, creating a beautiful compliment to the 320 layer Damascus Steel Blade. Blade composition includes the pistol barrel Dave Sevigny used to win the 2008 USPSA Limited-10 Nationals at the US Shooting Academy in Tulsa, Oklahoma and later the 2009 USPSA Limited-10 Nationals at the Boulder Rifle and Pistol Club in Boulder City, NV. The wins marked Dave’s 8th and 9th USPSA National championships. On top of the National Championships, Dave used this barrel for practice, training and to win several other regional and state level championships. 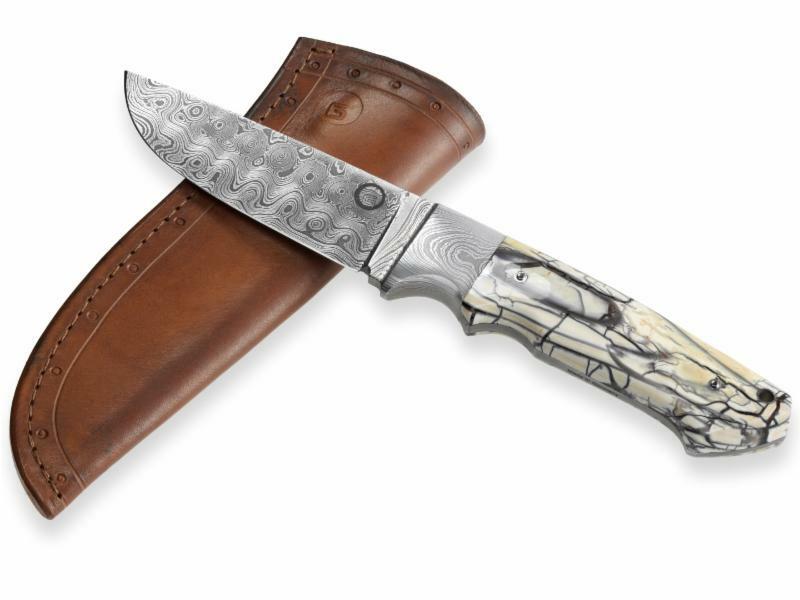 This all-purpose hunting knife is as functional as it is beautiful. The finger grooves in the hardened ivory handle make this blade as easy in the hand as it is on the eyes; the full-tang Damascus blade provides near perfect stability. Blade composition includes the pistol barrel Dave Sevigny used to practice and train for his competitions. Perhaps the simplest of the gun barrels has produced the most striking of the three knives. The same 320 layer Damascus steel blade is the soul of this knife, with the same form and function as knives one and two. Where this knife shines is the dark stained handle, made from Mammoth Molar Rind, the rich dark brown flashing in contrast to the beautifully patterned blade. All three knives are unique, with individual serial numbers; and come complete with a traditionally crafted saddle leather scabbard. Only GASTON J. GLOCK style LP carries these exclusive knives, and these are the only three on the planet. This never before seen combination of function and craftsmanship has created three knives that you’ll pass on from generation to generation as works of art, but at the same time have preserved the legacy of function earned by the hard-used championship firearm barrels they are made from. Beautiful, and waaaaaaaaaay outside my wallet.